Food Costs > How Much Does Baking Powder Cost? Baking powder is one of the necessary ingredients to stock in a kitchen. This is a raising agent that is commonly used in baking cakes and bread, and types of baking powder can include double-acting baking powders and single acting baking powders. “Baking powder” (CC BY 2.0) by Mel B. A simple baking powder container found at a local grocery store can cost $1.50 to $4 per 10-ounce container. The price will depend on the quantity, brand and where it’s purchased. For example, the best seller on Amazon.com — Calumet Baking Powder — retails for about $2. Bulk baking powder, often sold in five-pound bags, can cost about $7 to $15. At webstaurantstore.com, for instance, a five-pound container of double acting baking powder retails for $12.50. What does baking powder do? Baking powder will consist of a combination of baking soda, cream of tartar and some sort of moisture absorber, such as cornstarch, so it doesn’t react until liquid is added to it. Most baking soda on the market today will be labeled as double-acting, which means it will react to both the liquid and heat; this will happen in two stages, hence the name. The first reaction takes place when the liquid is added while mixing it in. When the liquid reacts, it will create carbon dioxide gas, which helps the gas cells rise in the batter when being baked in the oven. If you order the baking powder online, you may have to spend extra for shipping if you don’t meet the retailer’s minimum. Baking powder should always be mixed with dry ingredients before adding any liquid. Once the liquid added, a chemical reaction will take place, creating carbon dioxide to increase the consistency and size. It may be best to avoid baking powder that comes in cardboard containers because oftentimes, the baking soda can be dead before it’s even able to be used. As most bakers know, baking soda that is dead won’t work. Be sure to test baking powder before using it. A simple trick is to mix a teaspoon of the powder, followed by a half cup of water. If it starts to bubble up, it’s going to be good. Too much baking powder can often taste bitter, so it’s important to follow the directions closely. It can also cause the batter to rise too fast, causing it to collapse. On the other hand, if there’s too little baking powder, the batter will be too tough and will crumble when you pick it up. Is baking powder the same as baking soda? 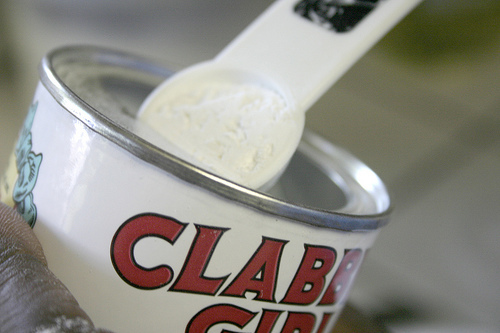 Baking powder does contain baking soda as it’s a mixture of the baking soda, cream of tartar and sometimes cornstarch. While it isn’t the same, it can be used in recipes that call for an acidic ingredient since the baking soda can still act as a leavening agent. If you want to use baking powder instead of baking soda, here’s what you will need to do: As a rule of thumb, use two to three times more baking powder than what’s called for baking soda. If the recipe is calling for 2 teaspoons, you will want to use at least six. This will not have an effect on the taste. Buying in bulk can cost less than buying individual packs at local grocery stores. With our example above, a five-pound bag can cost $2 to $3 more, but you will get four times the amount. Be sure to check for coupons or promotions to see what kind of deals are out there. Many major brands will put coupons on their website or even Facebook page. Store brands will have the same ingredients as the name brand, but it can cost up to 40 percent less. it was a 1lb plastic container but i didn’t use it all before it died on me. looking back, i realized i never have managed to get through a container. usually, it’s about half before it’s pooched at a cost ranging from 3 to 5 a pound. therefore, the actual unit cost is doubled per pound since i’m throwing away half. now, i make my own single-acting baking powder. it’s 1 tsp cream of tartar ($10/lb) plus 2tsp baking soda ($1/lb) for a unit cost of $4 – but it’s 100% used, since i only make it up as i need it. bonus: i don’t lose shelf space in the fridge for a separate baking powder container.